For two decades, carbon dioxide was touted as the silver bullet for halting climate change. What about methane, what about NO2, and what about soot? Soot, that black carbon that causes smoggy skies (and has sent Beijing's Pollution Index right off the charts) is the number two contributor to global warming, second to carbon dioxide, according to a four-year assessment by an international panel that is not the Intergovernmental Panel on Climate Change. The new study concludes that black carbon, the soot particles in smoke and smog, contributes about twice as much to global warming as previously estimated by the 2007 IPCC report. "We were surprised at its potential contribution to climate," said Sarah Doherty, a University of Washington atmospheric scientist and one of four coordinating lead authors. The good news for us all is that controlling soot can deliver more immediate climate benefits than trying to control carbon dioxide. Some previous research had hinted that models were underestimating black-carbon emissions from such things as open burning of forests, crops and grasslands, and from energy-related emissions in Southeast Asia and East Asia. Black carbon's role in climate is complex, just like methane and CO2. Dark particles in the air work to shade the Earth's surface while warming the atmosphere. Black carbon that settles on the surface of snow and ice darkens the surface to absorb more sunlight and increase melting. Finally, soot particles influence cloud formation in ways that can have either a cooling or warming impact. The report surveyed past studies and included new research to quantify the sources of black carbon and better understand its overall effect on the climate. Doherty was executive director of the International Global Atmospheric Chemistry Project in 2009 when policy groups were seeking better information on the benefits of reducing black-carbon emissions. The scientific body undertook a comprehensive assessment, supported by IGAC and the U.S. National Oceanic and Atmospheric Administration. "Because of a lack of action to reduce carbon dioxide emissions, the policy community is asking what else we can do, particularly to help places like the Arctic that are melting much more quickly than we had anticipated," Doherty said. "We hope reducing black-carbon emissions buys us some time. But it doesn't replace cutting back on CO2 emissions." While carbon dioxide has a half-life of 100 years, black carbon stays in the atmosphere for only a few days. The authors investigated various sources of black carbon to see which reductions might have the most short-term cooling impact. Regulating emissions from diesel engines followed by replacing some wood- and coal-burning household stoves, authors find, would have the greatest immediate cooling impact. "If you're just thinking about impact on climate, you would want to be strategic about which sources you cut back on," Doherty said. "We looked at the overall impact because some of these sources also emit associated particles that can have counteracting effects." Black carbon contributes to climate change in the mid to high latitudes, including the northern United States, Canada, northern Europe and northern Asia, as well as affecting rainfall patterns of the Asian Monsoon. 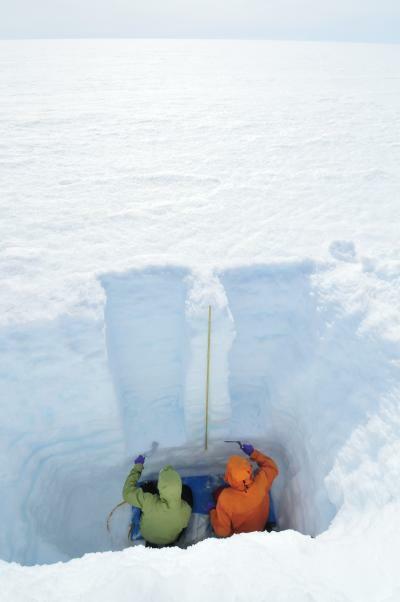 The report incorporates data that Doherty and co-author Stephen Warren, a UW professor of atmospheric sciences, gathered between 2007 and 2009 to measure soot on Arctic snow. Calculating black carbon deposits in the Arctic is difficult, so data are essential for testing and correcting models.